Heat the oil in a large nonstick skillet over medium-high heat. Add the onion, ginger, cumin and cinnamon; cook, stirring frequently, 4 to 5 minutes. Add the tomatoes, broth, peas, olives and raisins; simmer 7 to 8 minutes. 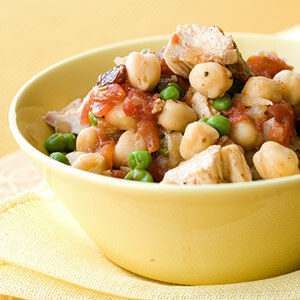 Add the chicken and chickpeas; cook 3 to 4 minutes, until chicken is heated through. PER SERVING: 405 cal., 10 g total fat (2 g sat. fat), 49 g carb. (9 g fiber), 32 g pro.